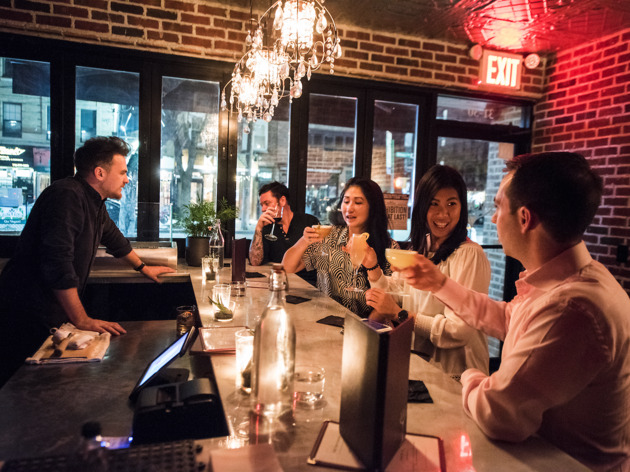 The Last Word, an Astoria cocktail bar in the speakeasy style, opened last year in the rear of a fake hardware store on Ditmars Boulevard, at the end of the N and W train lines. Recently it renovated, turning the front into a proper part of the bar and shedding the theatrical pretense. 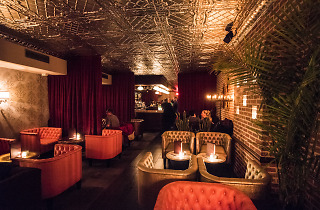 You walk inside now because you want a cocktail, not a faux-speakeasy experience: The cocktails are enough of an experience on their own. 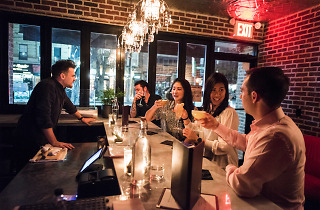 Thank God for Astoria rents, because here there is finally enough luxurious breathing room for tipplers to unwind and remember that there is not only an intimacy in being crammed into a tiny booth but also in having the space to breathe. Candlelight replaces now-cliché incandescent Edison bulbs as velvet curtains, along with tufted leather armchairs and love seats, add texture for all the senses. On a recent visit, we saw a nearby couple request a seat change from two armchairs to one loveseat; it was granted, and they expressed their gratitude by quickly becoming quite, um, loving. 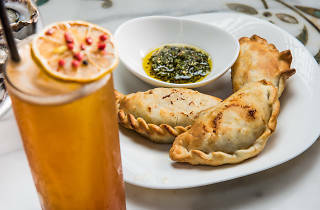 The warm cocktails are the stars here, especially the Domingo en San Martin, a lavish, smoky take on Mexican hot chocolate. After your first sip, an angel may appear on your shoulder and whisper, “Ooh! Chocolate ganache! Let’s try that again!” and, on your other shoulder a devil may cheer with, “Hell, yeah, that sotol has some kick! Let’s try that again!” It’s a win-win. The spiced-pear whipped cream float of the pumpkin-spiced, hazelnutty cocktail Jersey Harvest is Starbucks for adults, in all the best ways. The Whine nHot mixes red grenache and apple brandy with the dexterity of a kalimotxo; after being tossed on crashing waves of tang and tannins, a garnish of grapefruit shrub and orange peel releases a citrusy stowaway to dance upon the palate. The menu is at best surprising and at worst mismatched. 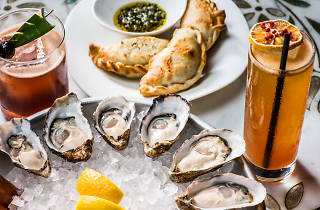 Who exactly pairs oysters with cocktails, especially hot or sweet ones? 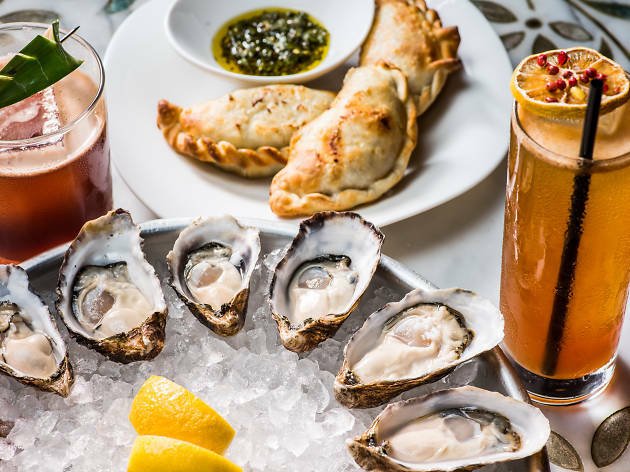 But, damn, those Chelsea Gem oysters are pearls and such savory, albeit jumbled, complements to the empanadas. 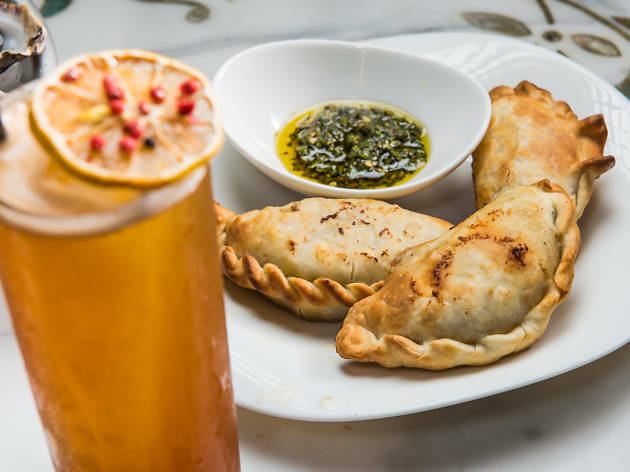 The pastry pockets are all elevated by the chimichurri—but our favorite was the tomato-mozzarella option. 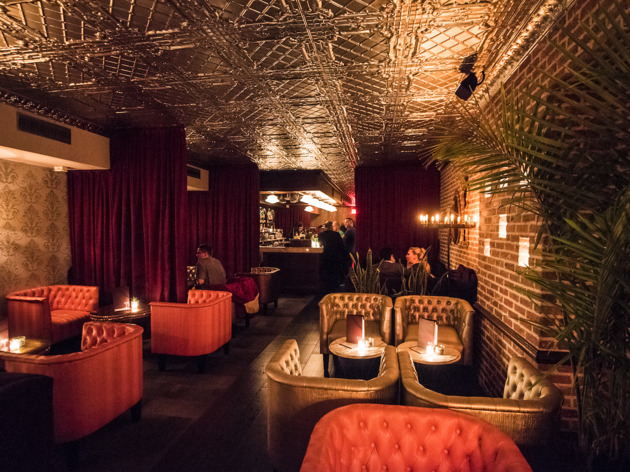 Since most of the speakeasies I've visited have been in the city, I was sure what to expect from a queens speakeasy that plenty hadn't even heard of. But boy was this city girl surprised. Find it was fun. A hardware store store front. But it it looked closed legit closed. Peaking in the hostess opened the door to a fake hardware store. But so real looking!!! Pulling back red velvet drapes & you are greeted by exposed brick walls, more red velvet drapes, large plush seats & tapestry wall paper & candle light. We said we'd only go in for a drink but we ended up staying for quite a few rounds & food. We experimented and tried several different drinks & none disappointed. I'm sure it gets packed during the weekend, but weekdays don't bring much of a crowd & small groups came & left through out the nite. Perfect for a cozy date or a cool spot to meet up with friends.